Luxury Travel Magazine has released its Spring 2018 edition with a bold, fresh and contemporary new design featuring a 40-page cover story on luxury cruising. The new-look print magazine also coincides with the launch of an exciting new digital destination, Luxury Travel Cruise (cruise.luxurytravelmag.com.au) – a companion website to luxurytravelmag.com.au. 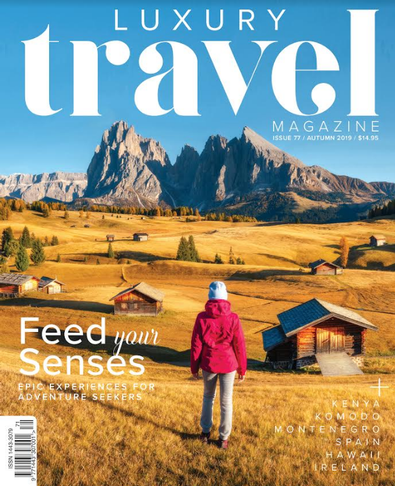 The 180-page issue showcases 40 pages of the world’s best luxury cruising, as well as major features on Borneo, Canada, Ireland, New Zealand, Tahiti, Tasmania and Vietnam, an in-depth City Guide to Cape Town, and a host of other global and Australian destinations. The sort of magazine you can&apos;t bear to throw away. It&apos;s beautifully designed even though the destinations are a bit out of my reach. Still, it doesn&apos;t hurt to dream!